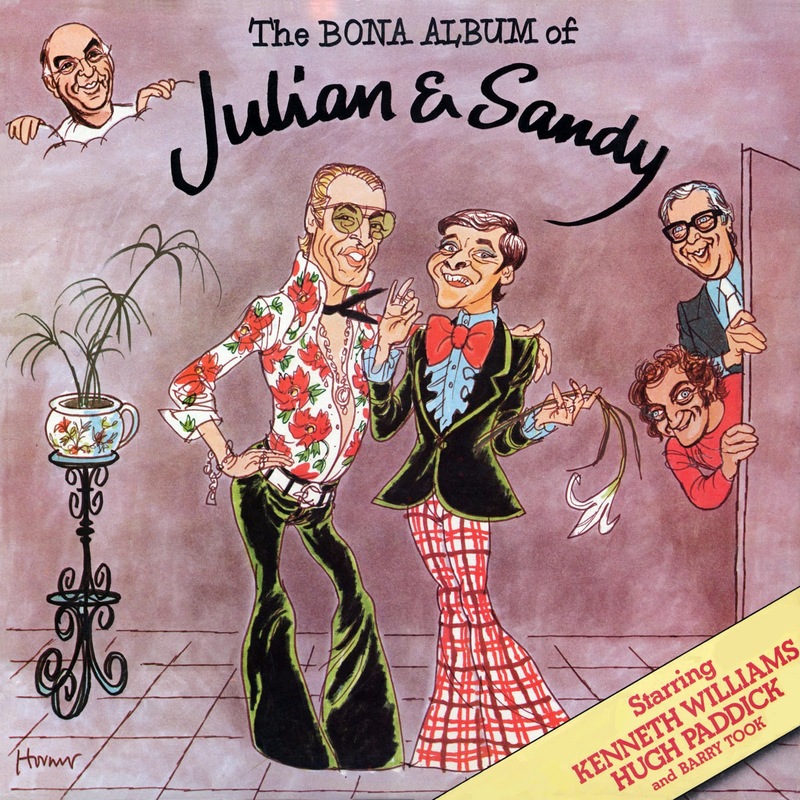 Julian and Sandy (played respectively by Hugh Paddick and Kenneth Williams) first saw the light of day on 28th March, 1965, in the hit radio show Round the Horne. They soon became firm favorites, not to say national figures, and appeared in over sixty programs before the untimely death of Kenneth Horne ended Round the Horne forever. 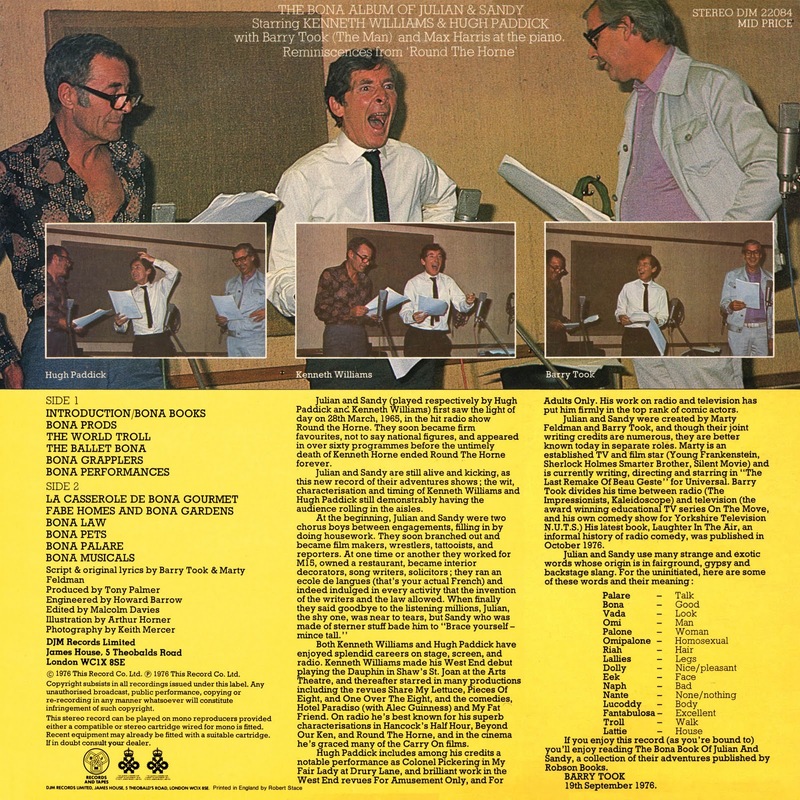 Julian and Sandy are still alive and kicking (at this writing -JimG), as this new record of their adventures shows; the wit, characterisation and timing of Kenneth Williams and Hugh Paddick still demonstrably having the audience rolling in the aisles. At the beginning, Julian and Sandy were two chorus boys between engagements, filling in by doing housework. They soon branched out and became film makers, wrestlers, tattooists, and reporters. At one time or another they worked for MI5, owned a restaurant, became interior decorators, song writers, solicitors; they ran an ecole de langues (that's your actual French) and indeed indulged in every activity that the invention of the writers and the law allowed. When finally they said goodbye to the listening millions, Julian, the shy one, was near to tears, but Sandy, who was made of sterner stuff, bade him to "Brace yourself—mince tall." Both Kenneth Williams and Hugh Paddick have enjoyed splendid careers on stage, screen, and radio. 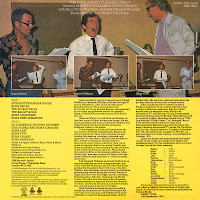 Kenneth Williams made his West End debut playing the Dauphin in Shaw's St. Joan at the Arts Theatre, and thereafter starred in many productions including the revues Share My Lettuce, Pieces of Eight, and One Over the Eight, and the comedies Hotel Paradiso (with Alec Guinness) and My Fat Friend. On radio he's best known for his superb characterisations in Hancock's Half Hour, Beyond Our Ken, and Round the Horne, and in the cinema he's graced many of the Carry On films. Hugh Paddick includes among his credits a notable performance as Colonel Pickering in My Fair Lady at Drury Lane, and brilliant work in the West End revues For Amusement Only and For Adults Only. His work on radio and television has put him firmly in the top rank of comic actors. 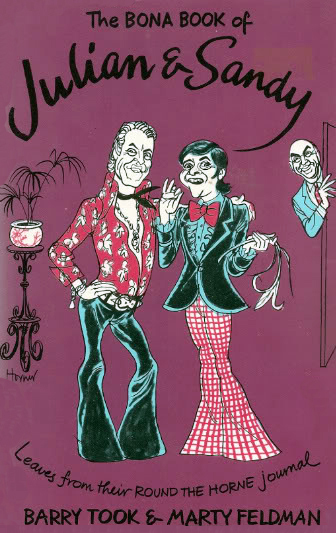 Julian and Sandy were created by Marty Feldman and Barry Took, and though their joint writing credits are numerous, they are better known today in separate roles. Marty is an established TV and film star (Young Frankenstein, Sherlock Holmes' Smarter Brother, Silent Movie) and is currently writing, directing and starring in The Last Remake of Beau Geste for Universal. Barry Took divides his time between radio (The Impressionists, Kaleidoscope) and television (the award-winning educational TV series On the Move, and his own comedy show for Yorkshire Television N.U.T.S.). His latest book, Laughter in the Air, an informal history of radio comedy, was published in October 1916. 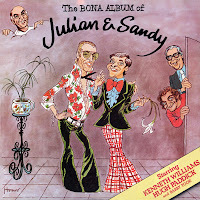 0 comments on "Julian & Sandy - Bona Album Of Julian & Sandy 1976 (UK)"